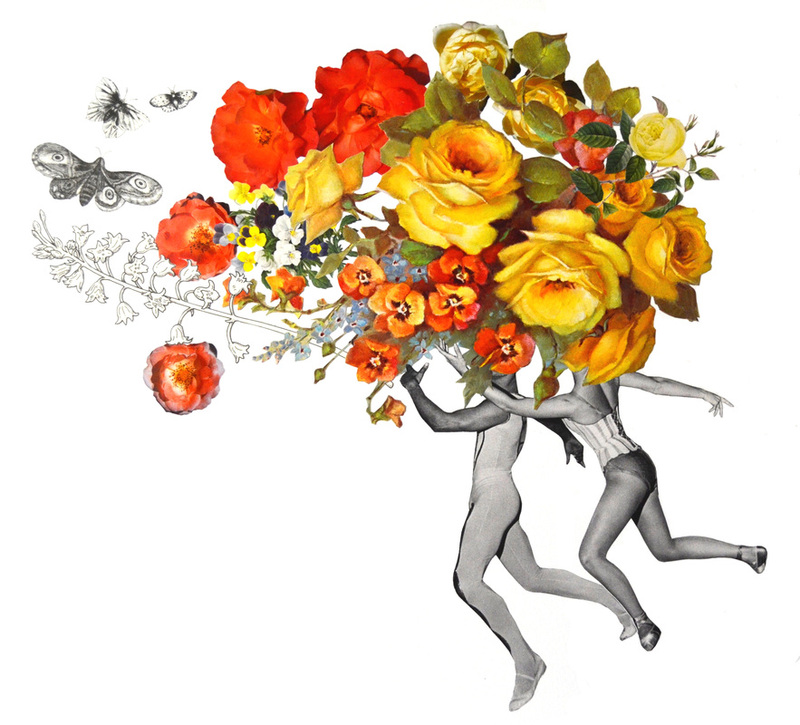 Julia Dittberner Neuman talks with Amber about her analog collage work and her career designing flower arrangements. Julia says "I’ve always associated colors with numbers, shapes, and letters. As a child, I assumed it was a trick of memory, a result of too much Sesame Street and Dr. Seuss. Later, I learned about synesthesia. Color-based organization and categorization became automatic and endlessly gratifying." These paper collages attempt to reconstruct color wheels, meticulously using natural and fantastical images as whimsical mnemonic devices. I’ve always made things, primarily taking materials apart and putting them back together. My mom and grandmother sew and quilt, so textiles were a part of my art practice when I was younger and throughout art school. That’s when I began “reconstructing” materials, eventually leading to working with paper. The collages started about five years ago when I worked at a library at a fashion school. There were piles of out of date magazines for students to use for mood boards so I started sifting through them. I’ve been cutting things up on and off since then. I subscribe to a lot of magazines, mostly fashion, food, and wedding industry-related. That’s where I started sourcing, but it left a lot of the images and subject matter up to chance. Now, I mostly shop the dollar book section at the local used bookstore and sometimes order textbooks and calendars online. What is your process like? Do you start with an idea or plan for a collage that dictates what images you source or are you driven by the images available? I make design challenges for myself— I really want to be a better designer; to create movement using color and shape. I choose images that lend themselves to that, like the birds and dancers. It’s best to go into a piece without expectations or attachments to an idea. That said, since I use found materials, sometimes I’ll set out to make one type of piece and find a striking picture and center a design around that. Do you have a personal concept behind your body of work? Or each piece? I’m drawn to the ephemeral in concept and process. I think that is reflected in the natural images I use. Colors in flowers, stones, animals… they’re so spectacular. When I hear someone say that a color doesn’t exist in nature, I want to show them spring flowers or tropical birds. Also, making work on paper feels transitory. It doesn’t have the imposed permanence of a painting or three-dimensional object. Do you utilize Photoshop or any computer programs or is everything done by hand? My husband and I live in a loft, so my work “area” expands and contracts depending on what I’m working on. I try to keep our space open and light. Right now, my book and magazine collection is out of control. I need to purge and refresh. 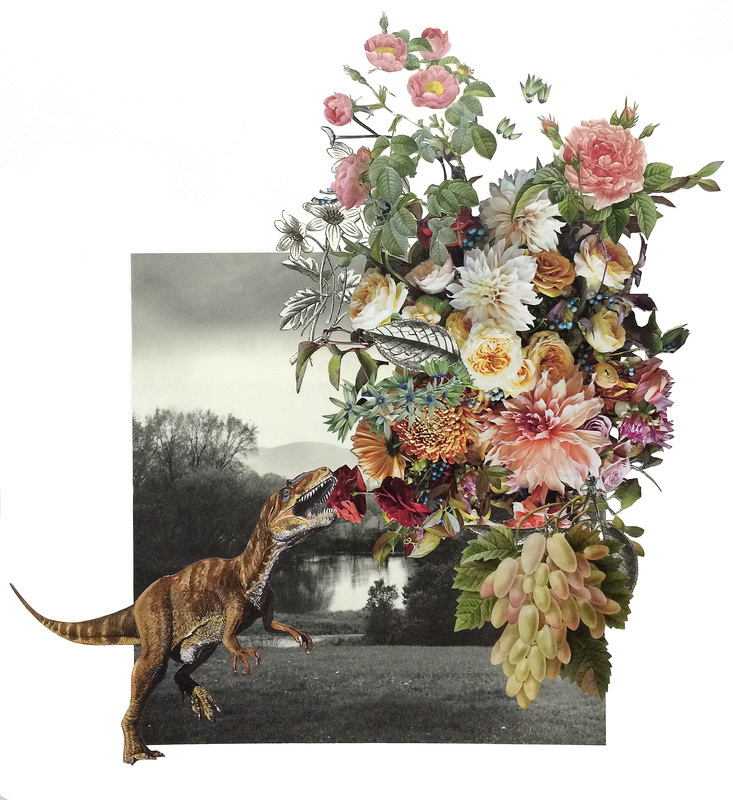 What is your favorite part about making collage work? I can be fairly meticulous and really like cutting things apart and putting them back together. Quilting and sewing was a big part of what I’ve done in the past and I’m currently working as a floral designer. Collaging feels like a natural iteration of those techniques. Did the flower work start to inform your collages or vise versa? I work freelance as a florist, so when I come into a job, I have one shot to make something before it goes out the door. 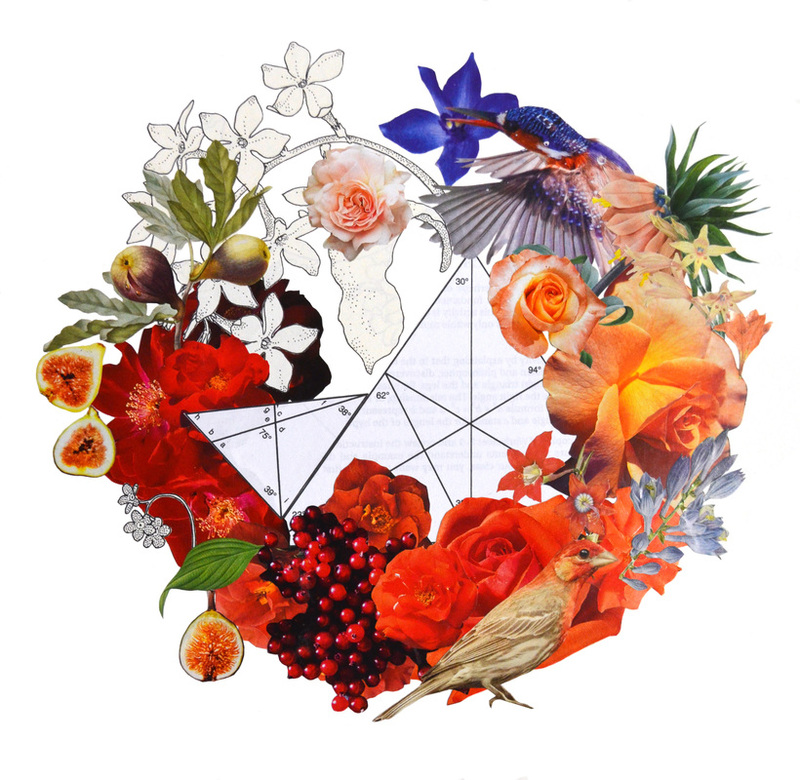 I wanted to improve my design skills without spending a lot of money buying flowers on my own, so I started seeing the collages as a tool to improve my work in general. How do you see them, as separate careers or as different aspects of the same work? I don’t see much of a distinction—every experience influences the next. How did you come to start posting your collages on Instagram? I try to be honest with my social media and spend a lot of time making my work, so it felt natural to start sharing it. How has Instagram been a tool for your career, or source of inspiration as an artist? I have some very talented artist friends (@kitkite @zachclarkis @lesli3marie) who have posted a lot of work on Instagram and it has really influenced their processes. It’s inspiring to see what other people are working on, particularly in collage and floral design by using hashtags, and I’ve made some connections for shows and sales, which is great! Hopefully, I will keep on making stuff and keep on exploring! "Quilting and sewing was a big part of what I’ve done in the past and I’m currently working as a floral designer. 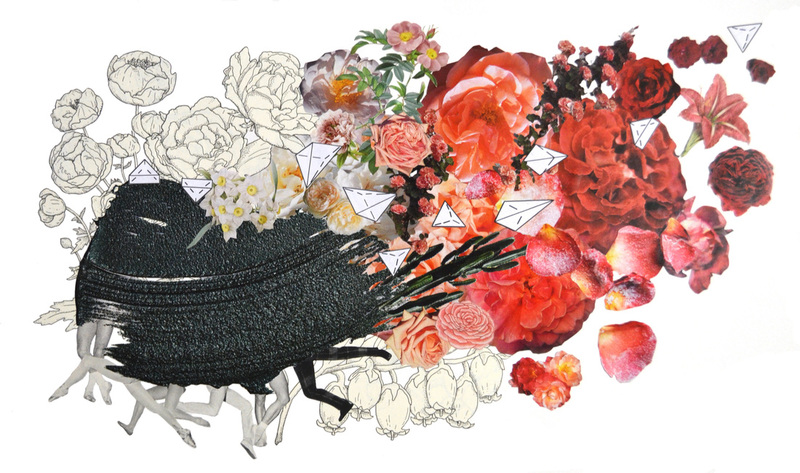 Collaging feels like a natural iteration of those techniques."